PracticeLink.com Summer 2018 77 live & practice physicianrecruit@imail.org | 800.888.3134 PhysicianJobsIntermountain.org Helping people live the healthiest lives possible. Utah has no shortage of outdoor adventure. It's also home to one of the best healthcare networks in the nation. 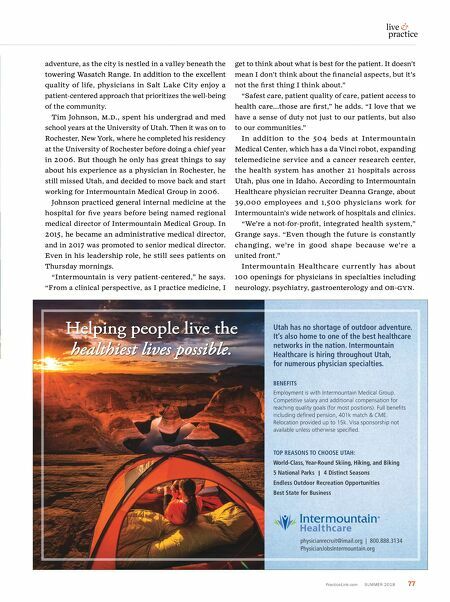 Intermountain Healthcare is hiring throughout Utah, for numerous physician specialties. BENEFITS Employment is with Intermountain Medical Group. Competitive salary and additional compensation for reaching quality goals (for most positions). Full benefits including defined pension, 401k match & CME. Relocation provided up to 15k. Visa sponsorship not available unless otherwise specified. 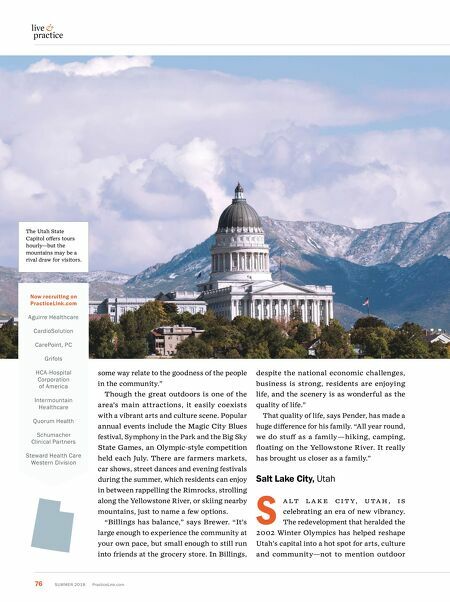 TOP REASONS TO CHOOSE UTAH: World-Class, Year-Round Skiing, Hiking, and Biking 5 National Parks | 4 Distinct Seasons Endless Outdoor Recreation Opportunities Best State for Business adventure, as the city is nestled in a valley beneath the towering Wasatch Range. In addition to the excellent quality of life, physicians in Salt Lake City enjoy a patient-centered approach that prioritizes the well-being of the community. Tim Johnson, M.D., spent his undergrad and med school years at the University of Utah. Then it was on to Rochester, New York, where he completed his residency at the University of Rochester before doing a chief year in 2006. But though he only has great things to say about his experience as a physician in Rochester, he still missed Utah, and decided to move back and start working for Intermountain Medical Group in 2006. Johnson practiced general internal medicine at the hospital for five years before being named regional medical director of Intermountain Medical Group. In 2015, he became an administrative medical director, and in 2017 was promoted to senior medical director. Even in his leadership role, he still sees patients on Thursday mornings. "Intermountain is very patient-centered," he says. "From a clinical perspective, as I practice medicine, I get to think about what is best for the patient. It doesn't mean I don't think about the financial aspects, but it's not the first thing I think about." "Safest care, patient quality of care, patient access to health care...those are first," he adds. "I love that we have a sense of duty not just to our patients, but also to our communities." In addition to the 504 beds at Intermountain Medical Center, which has a da Vinci robot, expanding telemedicine service and a cancer research center, the health system has another 21 hospitals across Utah, plus one in Idaho. According to Intermountain Healthcare physician recruiter Deanna Grange, about 39,000 employees and 1,500 physicians work for Intermountain's wide network of hospitals and clinics. "We're a not-for-profit, integrated health system," Grange says. "Even though the future is constantly changing, we're in good shape because we're a united front." Intermountain Healthcare currently has about 100 openings for physicians in specialties including neurology, psychiatry, gastroenterology and OB-GYN.